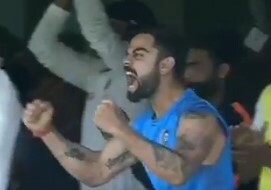 Virat Kohli must be the dictionary definition of hard-to-please, for no-one on earth is an enraged by their own success as he is. 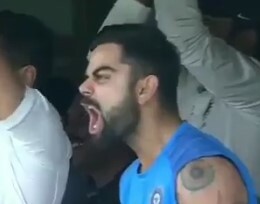 When Kohli makes a hundred, he’s angry. When his team wins a series over Australia – even though he’s not actually playing – he’s positively enraged. We’ve done detailed analysis of a grainy video posted to Twitter to prove that second point. 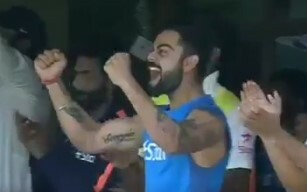 Somewhat unexpectedly, Kohli’s initial reaction to series victory is something that could, at a push, be construed as pleasure. It isn’t long however before that emotion starts to make way for something else. The eyebrows are starting to harden. The jaw is tighter. The fists are starting to clench. By this point it’s unmistakeable. Virat Kohli is decidedly pissed off about winning a Test series against Australia. This is where he ends up. Absolutely sick to the back teeth, the front teeth and tonsils of experiencing sporting success against his rivals. Someone is going to pay for this positive outcome. All of the Australian team, if his post-series words are anything to go by. A strong start to the season for Leicestershire. I’m full of confidence this year. Six bowleds, at least three from comical leaves outside off. Going to be a long tough season! Apparently the latest set of law changes from the ICC will address the inbuilt sexism and racism in many cricketing terms. I know what you’ll be saying – this is political correctness GONE MAD. But actually this is a good thing – any way of making the game feel more inclusive is clearly important. BATSMAN will survive, apparently, applying to men and women. As the saying goes, BATTER is only good for baseball and fish. CHINAMAN has gone though, along with WEIRDY WEIRDY FOREIGN STYLE. Also please consider changing SOUTH-PAW, OFF-BREAK & LEG-BREAK. They all discriminate against left handers. Are you pandering to sinister cack-handers, Marees? What about people, like me, who are a bit dexter-fluid? 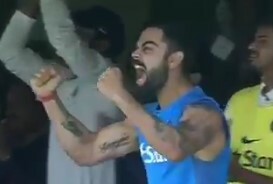 I completely understand Kohli’s gamut of emotions. I have just been through them myself in the matter of the Champions Match in Abu Dhabi. First the excitement and untrammeled joy when Middlesex snatched victory from the veritable jaws of defeat in this match. But soon joy turned to anger as several unanswered questions entered my head. Why was the might and wealth of the MCC, with the best of the rest of the 18 first class counties players to choose from, unable to defeat my beloved (but let’s face it, relatively small and sweet) Middlesex? Why did I have to go into the city for meetings today, then rush home to catch the last few minutes of the excitement, when the whole day could have been better spent in front of my computer screen watching the free live stream of this match? And although the live stream screen is small and indistinct, did I not witness Messrs Crane and Overton looking in a funny way at John Simpson ( a Middlesex man through and through despite his inability to pass the Bury/butter/bath shibboeth)? I’m not merely happy yet a little bit cross. I am red in the face shouting at the screen ecstatically angry. Was that a Carter USM reference in there, KC? Oh well spotted. And a B-side at that. Double points. Was there no table flip at the end? Or did the camera not stay on him for that long?